Amy Baker is an organizer. This self-described beer snob can regularly organize a dozen or two friends for a bicycle tour of her favorite craft breweries. Amy just finished organizing her fourth AZ Water Association fundraiser for Water for People, which improves water infrastructure in nine countries. City of Peoria residents have benefited from her organizational skills for more than a decade. The first nine years Amy was a chemist in Peoria’s water lab, which – yes - she helped to organize. 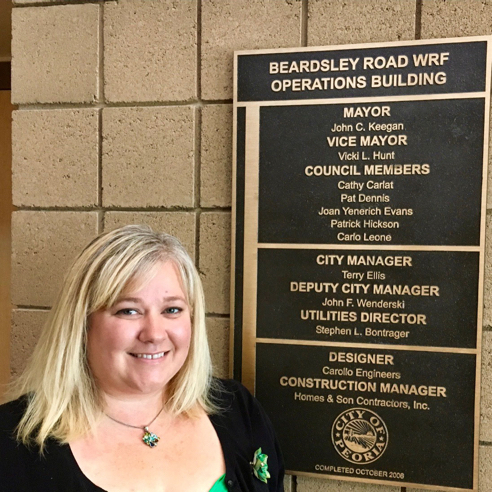 In January 2016, Amy moved up to coordinate the four-person inspection team that helps keep Peoria’s wastewater system operating in compliance with county, state and federal regulations. It can be smelly and there is a stream of paperwork, but Amy loves her job. Wastewater includes anything rinsed down residential and commercial sinks, down showers and tubs, flushed down toilets and drained from dishwashers and clothes washers. Like most cities, Peoria relies on gravity to quickly collect and carry wastewater away from neighborhoods and to a treatment plant. When wastewater hits a hill and gravity no longer works, the collection system uses a pump to lift the waste over the rise and send it flowing again – by gravity – to the plant. At the plant, the wastewater is treated, cleaned and cleared of pathogens so it can be reused as irrigation water, fill park lakes or be pumped underground to save for the future. When Amy first accepted the promotion, her department was down to two inspectors. That meant Amy had to don jeans and steel toed shoes and become an inspector for three months. Part of the job is collecting samples of “influent wastewater” or wastewater before it flows though a treatment plant. Inspectors must collect the wastewater from the sampling site with a piece of equipment called an “autosampler” and then transfer the sample into vials for the lab without contaminating themselves or anything around them. Amy calls it “very intricate and disgusting” work. It’s a task she never appreciated as a chemist when inspectors would deliver a carton of pristine samples to the lab. The sampling is important. Cities test wastewater coming into and out of treatment plants. Cities must know what is in the wastewater to clean it properly, screen for the 175 contaminants listed by the federal government, and reduce certain compounds to safe levels. Amy’s team also monitors air quality at wastewater sites and lift stations and responds to odor complaints. Fats, oils and grease inside a city’s wastewater system can clog the pumps and valves, lead to manhole overflows and make wastewater more difficult to treat and clean at the plant. Commercial kitchens are required to have “grease interceptors” that collect the grease from sinks and floor drains before it can enter the wastewater system. It’s Amy’s team members who inspect 600 grease interceptors at least once a year to make sure they have been regularly emptied, cleaned and are working in compliance with regulations. Amy’s team also keeps the city’s storm drain system in compliance with regulations. Cities don’t treat storm runoff and, in Peoria, it is discharged through “outfalls” into Skunk Creek and the Agua Fria River. Amy’s team makes sure runoff is not contaminating these waterways. They investigate illegal dumping in sidewalk storm drains and she has accompanied her inspectors to the outfalls during and after storms. They watch for signs of contamination, such as clarity issues, odor or an oily chemical sheen. If there’s evidence of contamination, it means someone is illicitly draining oil or paint or other liquids into the storm drain system. Amy’s team works to track it back to its source. Amy reviews lab reports daily and submits monthly, quarterly and annual reports required by the state, county and federal governments. The reports are public and your way of knowing your city is treating wastewater to state standards. All together, Amy is responsible for about 122 compliance reports every year. Amy lives in Phoenix with her two small boys and her husband Scott, a Registered Nurse. She has intimate knowledge of wastewater and, yet, she is excited about using purified wastewater as a new source for drinking water. The Arizona Pure Water Brew Challenge truck was at the 2017 WateReuse Symposium held in September in the City of Phoenix. Craft breweries competed to make the best beer using purified wastewater. Amy attended the symposium and reports that she preferred a Tamarind Sour Brown crafted by Tucson’s Crooked Tooth Brewing Co. This beer-snob knows her brew. Crooked Tooth won the competition’s People’s Choice award. For 48 years, Arizona Municipal Water Users Association has worked to protect our member cities’ ability to provide assured, safe and sustainable water supplies to their communities. For more water information visit amwua.org.